Christopher Blevins is a 21-year-old multidisciplinary cyclist with national championships in short track and cyclocross to his name. With a background in BMX and impressive achievements on the road, he’s been called one of the most promising cyclists of his generation. 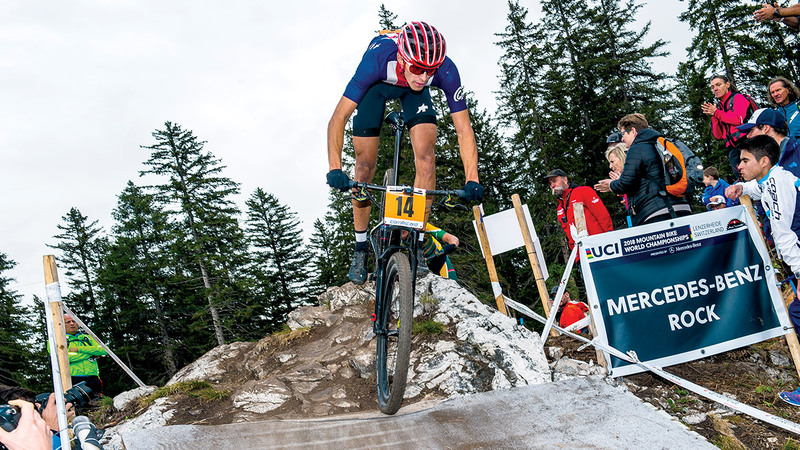 Last year he stepped away from road cycling in order to focus on the 2020 Olympics in cross-country mountain biking. We caught up with him to talk about how he uses TrainingPeaks to train for the unique demands of XC Mountain Biking. When did you start using data? My dad threw a power meter on my bike when I was probably about 12. In hindsight, it was a bit ridiculous to have one on when I was still in middle school… I still get a kick out of it. So I technically had [a power meter] from the start, but I didn’t start tracking my data until I got my first serious coach at age 16. Pretty much since then, I’ve been using TrainingPeaks. How did it change how you trained? I’ve been able to see how all the workouts link together with TP, so it just provides clarity to the bigger picture. It doesn’t change anything with how I think when I’m on the bike, but before and after my workouts, I can see how the pieces fit together much better than before I used it. What things do you look for and how do they help MTB? Cross-country mountain biking requires a pretty balanced training approach. You have to have a decent amount of volume, but also need to be explosive for the shorter efforts. I do a lot of on/off efforts, and after each one, I need to be able to recover quickly before the next. For workouts with on/offs, I’ll look at normalized power to see how I did. What’s the most important metric you track? While it’s important to track measurements of fitness, it’s probably more crucial to keep tabs on your fatigue. If you dig yourself into a hole you can’t out of, it can be really hard to get back on course. I have a lot of really hard weeks that leave me completely spent, but my coach and I always make sure I get a break afterward to realize the gains. You have to be super methodical at times when you’re trying to perform at the highest level. The race season is March through September, and with a season that long it’s important to keep track of your fitness all year. TrainingPeaks allows you to keep up on everything. For me, that’s helped with seeing how I’ve progressed, and what I need to keep shooting for in my training. It’s funny how satisfying it is when you nail a good week of training and all of the workouts are green. More than anything, it just keeps you held accountable toward reaching for your goals.